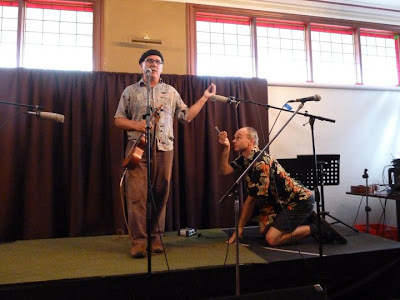 Tuning fork sales are on the rise down-under as the Play Ukulele By Ear Australian Tour continues to wind its way around the country extolling the advantages of tuning by ear with an A-440 tuning fork. And, as more ukulele players learn to tune by ear with a tuning fork, respect for this age old device is on the rise. Case in point, the presentation of the tuning fork ceremony at the recent Blue Mountains Ukulele Festival in Lawson, NSW. during the Blue Mountains Ukulele Festival.